My bro in law + family + his wifey's family will be coming over to my house tomorrow to pay my fil a visit. I had planned to serve them mi soto and for the kids I made them Sausage Bread Rolls. 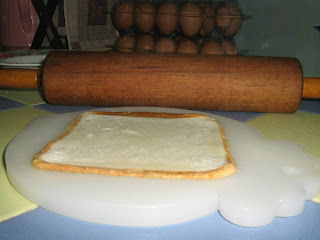 Roll bread to a thin layer using a rolling pin. 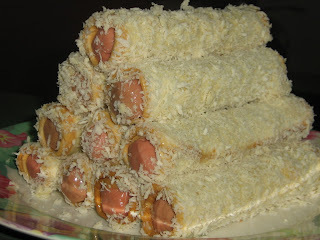 Place hotdog on bread and roll. Use "glue" to stick. Then dip it in egg and lastly roll it on breadcrumbs. Heat oil and fry the rolls till it is golden brown. Serve hot with chilli mayo. 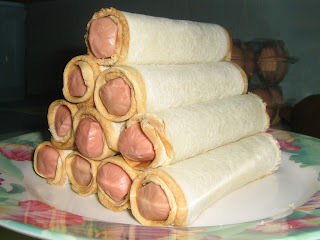 You may make the sausage bread rolls in advance and store them in freezer. This is a pic of the flattened bread. This is how it looks like before being dipped in egg and breadcrumbs. 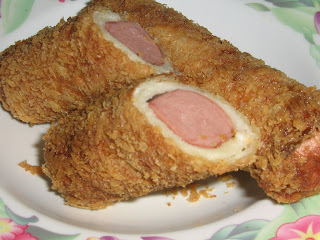 This is how it looks like after being dipped in egg and breadcrumbs.